Left: Leg without Hoof; Right: Leg with Hoof. 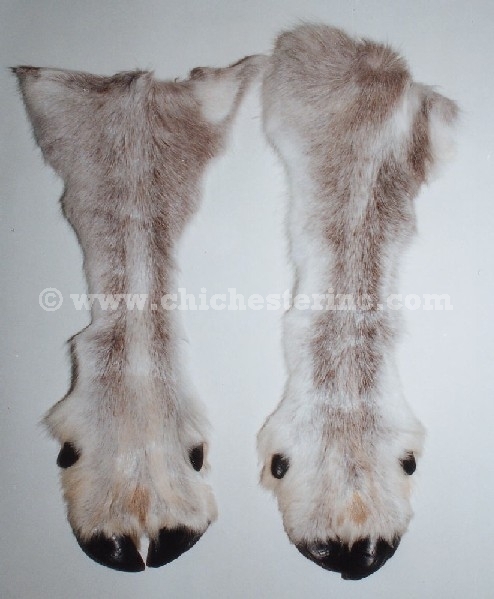 Twice a year we have the opportunity to import reindeer legs or feet with the hooves from Finland. Each piece comes with a 4 - 10" (10 - 25 cm) section of fur and either with or without the cleaned hooves. The 427-22 average about 13" to 14" long. The furs are not cased, they lay flat, and do not include bones. The reindeer feet are tanned.